A vehicle repossession can be an unexpected and serious disruption to your life. A repossession can leave you with a vehicle loan but no vehicle. If you’re at risk to have your vehicle repossessed, you might wonder if bankruptcy can help you keep your vehicle, erase your vehicle loan debt or both. Bankruptcy can be a helpful tool to stop a repossession action against you. You can use repossession to stop the repossession, keep your vehicle, negotiate new terms for your loan or get rid of your vehicle loan completely. There are multiple ways to use a bankruptcy proceeding to stop repossession on a personal vehicle and eliminate debt. In addition to vehicle repossession, you can also use a bankruptcy proceeding to address other types of repossessions like a boat, furniture, electronics, appliances, pianos, and other musical instruments. Why Choose Lawrence & Associates To Help Me? 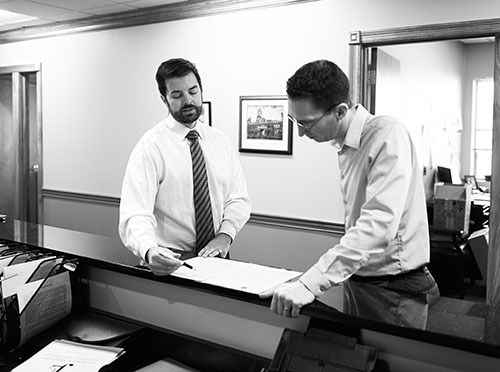 Our attorneys represent individuals across Cincinnati and Kentucky who are struggling to retain their property. We can help you if you’re facing repossession. Depending on the specifics of your situation, we can fight the repossession and explore the best options for you to regain control of your finances. You don’t have to lose the property that you worked so hard to obtain, nor do you have to accept the most drastic consequences just because you’ve fallen on some hard times. Our team will be here to sit down with you and discuss all of the options available to you so that you can make an informed decision about what is best for you and your family. What Happens To Repossessions In Bankruptcy? When a person files for bankruptcy, a car or other item that’s subject to repossession may be included as part of the bankruptcy proceeding. The bankruptcy proceeding can allow the debtor to become current on their loan or erase the loan as part of the bankruptcy proceeding. The debtor may choose whether to dispose of their vehicle or keep it. There are multiple ways to keep a vehicle during a bankruptcy proceeding. As long as the debtor can meet the requirements for an option, the debtor may choose what path to pursue as part of the bankruptcy. What Are the Options for Repossession In Bankruptcy? One way that a debtor can keep their vehicle in bankruptcy is by creating new terms for their vehicle loan with their lender. When the bankruptcy filing begins, the debtor can approach the lender to discuss new terms for the vehicle lease. The debtor may be able to lower their monthly payment, negotiate a new interest rate or discuss a new balance for the loan. Although it might seem like the lender does not have any incentive to negotiate a new vehicle loan, the existence of a bankruptcy proceeding can give the debtor reasons to be willing to renegotiate the loan. If the lender does not renegotiate the loan, the debtor has the option to release the vehicle without paying the remaining balance of the loan. Reaffirming the debt allows the lender to receive more payment for the vehicle than they might receive if the debtor decides to release the vehicle and refuse to pay the remaining loan. In the bankruptcy proceeding, the debtor can renegotiate terms with the lender that are favorable to both parties. During a bankruptcy proceeding, the debtor has the option to claim the vehicle for fair market value. Even if the debtor owes more on the vehicle than the vehicle is worth, the debtor can own the vehicle free and clear by paying the lender its fair market value. Once the debtor pays the fair market value, the remaining vehicle loan terminates. In order to redeem the vehicle, the debtor must be able to make a lump-sum payment for the value of the vehicle. Having the cash on hand to pay the fair market value of the vehicle can be difficult for a person facing bankruptcy, but if the debtor can make the payment, they own the vehicle free and clear. Redeeming a vehicle in bankruptcy gives the debtor the option to own the vehicle for a fair price without any obligation for the outstanding vehicle loan. In a bankruptcy proceeding, a vehicle debtor has the option to release the vehicle. They may give the vehicle back to the lender to sell at auction. If the debtor releases the vehicle, the bankruptcy proceeding may cancel the remaining debt. In a typical repossession, the debtor still owes the lender for any debts that exceed the value of the vehicle. In a bankruptcy proceeding, the debtor may return the vehicle and discharge the outstanding vehicle loan. After the bankruptcy is complete, the lender may not take additional action in order to collect the remaining loan balance. A debtor can use a bankruptcy proceeding to become current on a vehicle loan. The debtor can pay off the loan using a repayment plan that lasts between three and five years. In order to use a bankruptcy proceeding to become current on a vehicle loan, the debtor must use a Chapter 13 procedure. A Chapter 13 bankruptcy filing allows a debtor to stop repossession and make monthly payments in order to become current on their vehicle loan. The monthly payments are a reasonable amount based on the income and expenses of the filing party. What Happens In Bankruptcy If My Vehicle Is Already Repossessed? If your vehicle has recently been repossessed, it still may be a factor in your bankruptcy proceeding. If the repossession just occurred, the bankruptcy filing may force the lender to return the vehicle. Typically, you have a chance to reclaim the vehicle if it has been less than ten days since repossession and the lender hasn’t yet sold the vehicle at auction. If the vehicle is returned to you a short time after the repossession, you have all of the options for addressing the vehicle debt at your disposal. When a vehicle has already been sold at auction, it may still factor into your bankruptcy proceeding. The lender must submit the vehicle’s value for consideration as part of the bankruptcy if there is equity in the vehicle beyond the level of exemption in your state of filing. The repossession may be seen as giving a preference to the vehicle lender over other debtors. A creditor may be seen as preferred if they receive payment within 90 days of a bankruptcy filing. The trustee decides how to distribute payments among creditors including a vehicle lender who repossesses a vehicle shortly before a bankruptcy filing. What Is The Best Time To File Bankruptcy If You’re Facing Repossession? If you’re facing repossession, the best time to file for bankruptcy is before your repossession occurs. Submitting your official bankruptcy filing before the repossession happens leaves you with the most options. As soon as you file for bankruptcy, the repossession action must stop. Bankruptcy can help you with a repossession whether the repossession has just occurred or whether you’re behind in your payments and looking for options. However, the best time to file is when you realize that you’re unable to meet your obligations. The sooner you complete your bankruptcy filing, the sooner you can stop the repossession action and preserve your options regarding your vehicle and your other assets. Some clients who file for bankruptcy don’t want to stop their vehicle repossession. They may wonder if bankruptcy is right for them if they’re comfortable with letting their vehicle go in repossession. Even if you let your vehicle go to repossession, bankruptcy can still help you if you get behind in your vehicle payments. Without filing for bankruptcy, you’re responsible for the full amount of your loan. If your vehicle gets repossessed, the lender sells your vehicle to the highest bidder. They apply the amount of the vehicle sale to your loan. However, in that case, you still owe the remaining value of your loan. For example, if you owe $5,000 on your loan and your vehicle sells for only $3,500, you still owe the lender the remaining $1,500. If you file for Chapter 7 bankruptcy, you can discharge the remaining debt in your bankruptcy. The lender still sells your vehicle, and you no longer have it. However, the lender cannot pursue the remaining debt. When you file for Chater 7 bankruptcy, and you do not want to keep your vehicle, the proceeding can still be beneficial to you to extinguish your remaining vehicle debt and help you get a fresh start. When you’re facing a repossession action, the experienced bankruptcy attorneys at Lawrence & Associates can assist you. Our team can help you explore how bankruptcy laws may help you keep your vehicle, renegotiate the terms of your loan and even wipe out remaining debt on the vehicle. If you’re facing a vehicle or other repossession action, contact our professionals at (513) 351-5997 to see how bankruptcy can help you fight repossession and take control of your finances.